Schultz, First Canadian Junior Athlete Over 6000 points in Heptathlon. The Standard of the first stop at University Games, is gone. 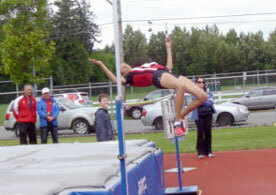 Ups, on the evening of April 8, Athletics Canada, updated the Ranking in the website. Canadian U20 Record (Pending) 6021, SCHULTZ, NINA Tuscon, 07/04/2017, Achilles International Society, posted the information at the website: www.haryjerome.com. And I was shocked. Who is this athlete. I famous coach from USA informed me by e-mail. Right there, I goggled in my computer, and realized that she is a freshmen of Kansas State University, and train with the well-known coach, Cliff Rovelto. I was curious, and continue my search, and Nina, was a long time member (10 years) of the New West Spartans Track and Field Club, a BC club of New Westminster, founded on 2007. I contacted her mom Debra Duan, and she told me that Nina, runs in her last event of 800m, 2:18.75, and achieved 6021 points, breaking the Canadian junior record in heptathlon. Looks like someone predicted time ago that she is able to run 2:18, and under. After winning bronze medal indoor pentathlon at Indoor NCAA D1, with a new Canadian Indoor record of 4341 points, everyone knows who is the first Canadian junior athlete, who jumped the border of 6000 points in heptathlon. Schultz, is ranked # 1 in the World IAAF list for 2017, in heptathlon for junior category. Schultz’s final score of 6,021 points is the fourth-best point total in program history, as well as the second-best mark in Division I this season behind Arkansas’ Taliyah Brooks (6,075) and the third-best heptathlon score in the world behind Erica Bougard (6,246) and Brooks. And now, I realized that she is the product of one of the best athletics school, prepared beside her, nine more members of the Canadian national teams, as Devan Wiebe, another standard of Summer Olympic Games in 800m with 2:03.21, Shannon Elmer, silver of NACAC, Jessica Hanson, a multidimensional athlete and a BC High School High Jump Champion, Sophie Pauls, a talented high jumper (1.59m as a 13 years old), S. Dodds, S. Cho, K. Tourigny, T. Harris, M. Kandola, Mihalilo Stefanovic, Anastas Eliopoulos, Thomas Nobbs, J. Schiedel, B. Pavel, N. Hole, K. Kazuta, and many other great athletes, with a total numbers of 28 Canadian National Champions, and 26 BC High School Champions. Schultz achievements, makes proud the coaching staff of the program, lead by the Head Coach, Tatjana Mece, a University Prof. from Albania, and many times the national champion of high jump and pentathlon, in her country. Way to go Nina to the second stop, at 2017 World London Championship. Your highway to Tokyo 2020 is paved. You just need to change the gears and drive faster. This entry was posted in championships, General on April 9, 2017 by webmaster. We have added some new photos and a video of Nina at the Canada Legion Championships. Be sure to have a look.